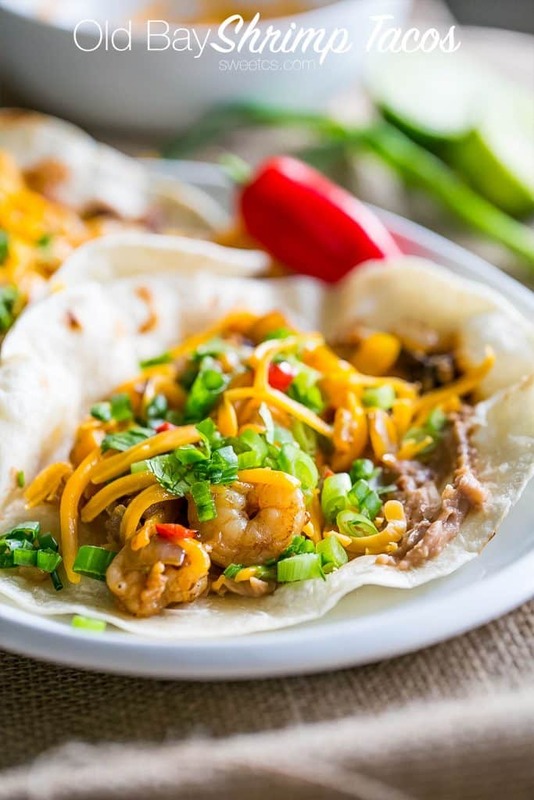 Fajita Old Bay Shrimp Tacos are delicious, full of flavor, so easy and fresh! A great lower calorie taco for a healthier taco night! I kind of have a thing for shrimp tacos, if you haven’t already figured out. 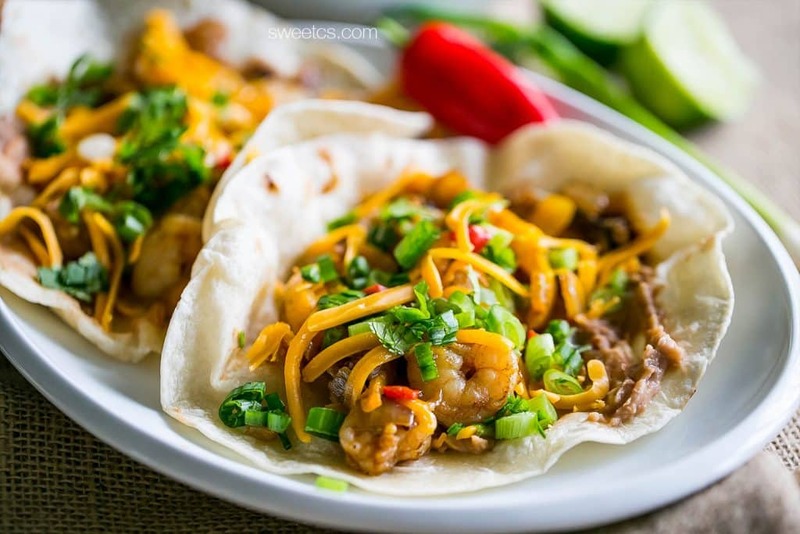 I love shrimp tacos- they are fast, easy, lower calorie, and SO delicious. 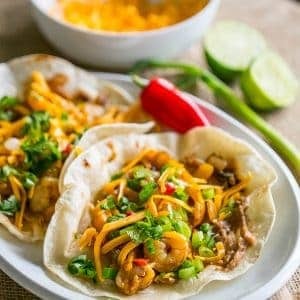 I’ve posted recipes for Habanero and Tomatillo Shrimp Tacos, Shrimp Fajita Lettuce Wraps, and a ton of other delicious shrimp dishes! These are perfect for taco bars, impromptu dinner parties, or just weeknight meals. 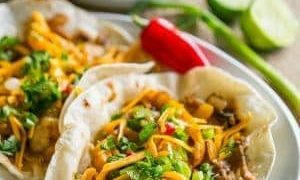 Be sure to slowly heat the peppers and onions and really brown them well- it adds a lovely, rich caramel flavor to the tacos without adding extra calories! 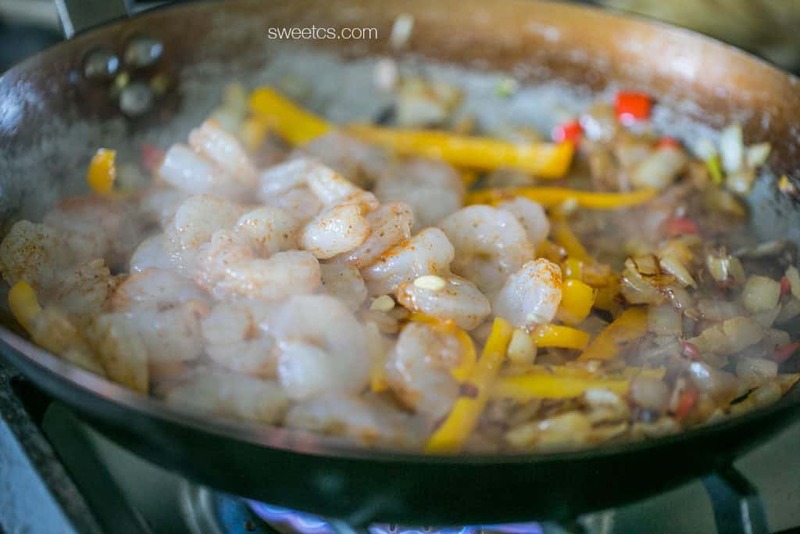 Once the peppers and onions are cooked, toss the shrimp right over them! 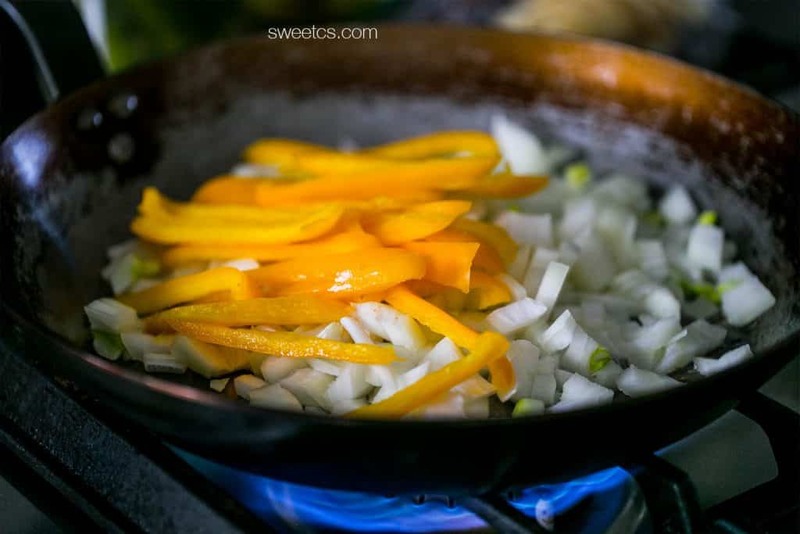 This helps to develop flavor even more- and lets them soak up some of the great onion and pepper aromas! Lastly, to make this an even more special dinner, I like to heat up the uncooked tortillas I grab at the grocery store. 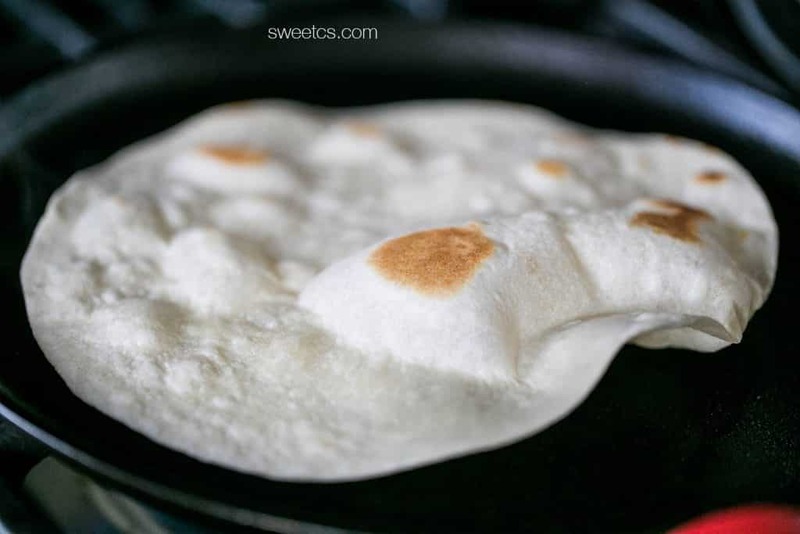 They are soft, chewy, and so easy to work with- not dry like a lot of tortillas can taste! In a large pan, heat oil on medium high heat until shimmery. Add onions and pepper, cook until moderately browned- about 8 minutes. Add shrimp and old bay seasoning, mix well. 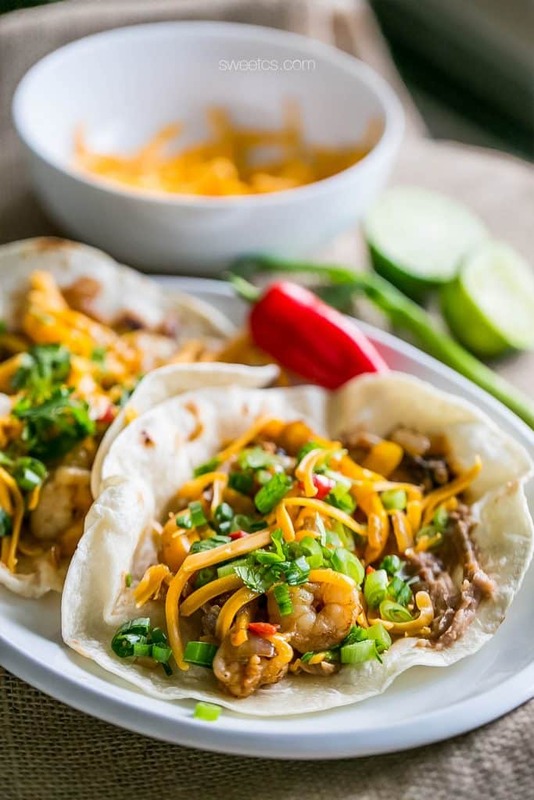 As shrimp cooks, heat uncooked flour tortillas on a griddle pan until lightly browned and puffy, removing and setting aside in a foil pouch to keep warm as they cook. When shrimp has cooked (about 6 minutes- shrimp will be pink and opaque), turn off heat. 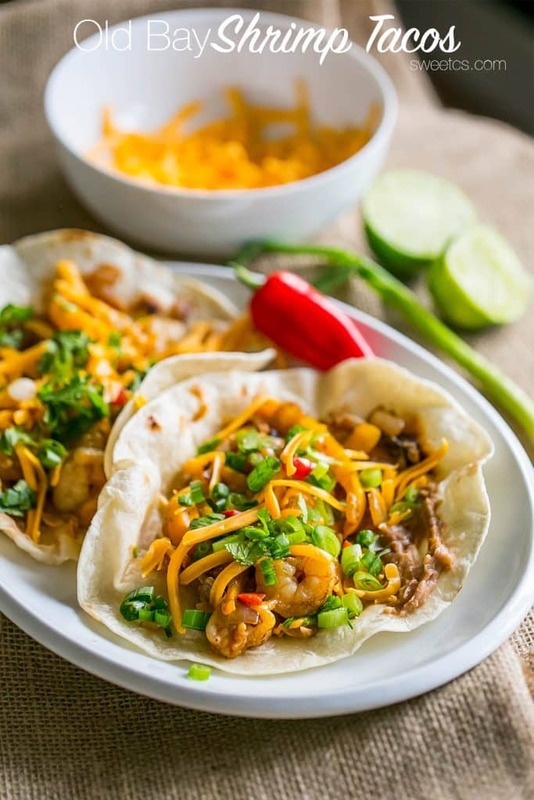 Assemble tacos with beans, shrimp and fajita mixture, and top with cheese, cilantro and green onions. I bet that old Bay is wonderful in this! Thanks for linking up to us on Throwback Thursday! These look delicious! Thanks so much for linking up with us at the best of the blogosphere. We’d love to have you back this week for another link up! These look so good! Love shrimp and these fajitas look just perfect! I love all things SHRIMP! These look delicious!